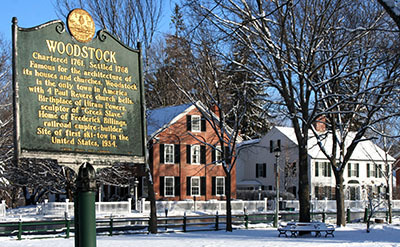 Picture perfect in every season, Woodstock is the quintessential Vermont town. Real estate architecture is Late Georgian, Federalist style and Greek revival on houses that line the main streets and town green. This town is beautiful and has been a recreational VT real estate escape for well over a century. Unique shops (Unicorn (fun video website), Red Wagon Toy Co., and others) cater to everyone in the family, offering everything from clothing, fine art, and antiques to maple syrup. The Pentangle Arts Council, in The Historic Town Hall Theatre on The Green, hosts international performers, current and classic movies, and local theater groups throughout the year. Woodstock boasts the only US National Park in Vermont, Marsh-Billings-Rockefeller National Historic Park. Children love to learn about the past and present at Billings Farm and Museum, a National Historic Landmark, which includes a working dairy farm and 1890 house that hosts regular educational programs throughout the year. Drive past covered bridges and west on Rt. 4 just 20 miles to arrive at Killington Ski Resort, the largest ski area in the Eastern US. Numerous B&Bs and the Woodstock Inn offer places for guests to stay while they enjoy the wonderful outdoors through hiking, cross-country skiing, golfing, swimming and countless other adventures. After you've checked out some Woodstock VT real estate listings, give us a call so we can talk about your new home in Vermont!